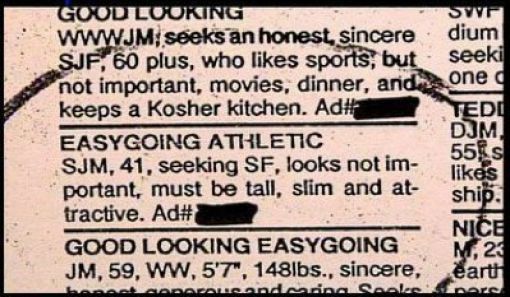 It’s an interesting process, perusing the personals. I follow gut instincts in whether or not to reach out to someone. I don’t post pictures (I see too many people I either know or recognize, and as I said, I’m kinda private about it!) and I usually don’t tweak my ad once its written. As I said above, I go in spurts. I will not look at all for months at a time and then I’ll hit it hard for a while. I’m not sure what the pattern is but having more time seems to lead to more perusing, that’s for sure. The latest Rochester Magazine features Single in the City folks – seven or so young singles talking about themselves and the Rochester dating scene. I can’t imagine being that public with my singledom, I never have. But I also know that I have people who are always thinking about me and looking for that guy who will make my eyes light up. Being single is something that I look upon as an adventure. My life is filled with great people and adventures, but having a partner to go forward in life with is still something I’m looking for! Have you ever been on this adventure? This entry was posted in Stuff About Me and tagged adventures, being single, changes, Dating, Personals, Relationships, sense of direction. Bookmark the permalink. Have a great weekend, Inna!!! I met my husband on Match.com. I used eHarmony as well and had terrible luck with it. I know a lot of people who met their partners online. It can be fun to meet people. It can also be really scary and disappointing. Best of luck!